The world is said to be confronted with complex issues working against the long term well-being of people and planet that can only be effectively addressed through (hyper) collective effort. How necessary collaboration comes about and progresses shows numerous approaches, professional specialisations, studies and examples. However, there is little in the way of a comprehensive, comparative perspective examining the instigator(s) of diverse collective action objectives and participants in co-creative relationships for societal change that are maintained over time and brought to fruition. 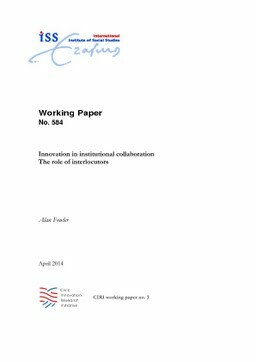 More critically, organisational innovations suggest that what currently exists to tackle intractable problems by getting institutions and their organisational actors to cooperate needs updating. Past approaches to collaboration are not good enough for operating in tomorrow’s conditions. Drawing on Actor Network Theory, this paper therefore explores a category of actant – an interlocutor – as potentially crucial in committing to, arranging and holding together complex collective action engagements. From multiple angles and using examples of organisational innovation, the analysis considers the interplay between interlocutor attributes and interlocution processes. A preliminary conclusion is that a combination of characteristics exhibited by an interlocutor offers a helpful category to explain and bring about multi-institutional problem solving. As importantly, increasing the number and variety of interlocutors across the world may be an agenda worth pursuing.